Navgrah TV Temp. FTA from SES8 Satellite, DD Free dish users can tune it. 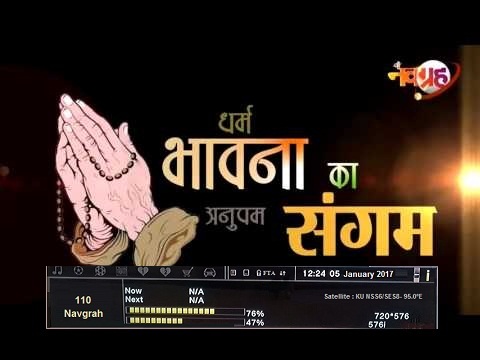 This is good news that Navgrah TV religious Hindi TV channel now temp. Free-to-air from SES8/NSS6 satellite at 95.0°E (Dish TV) which can be receive by DD Free dish / DD Direct Plus users. You can need to scan given below frequency in your DD Free dish STB to get this channel. DD Free dish / DD Direct Plus users can enjoy Navgrah TV channel simply tuning above frequency. You no need to adjust your dish antenna. Please keep visit us at www.dddirectdth.com for more information of temp. FTA channels for DD Free dish and real DD Free dish updates. Please note: We are not giving any trick to receive pay channels, this is temp. fta channel. You can get till it goes encrypted again.